I think I finally believe what I've been telling myself -- and others -- these past few years. I'm a maker, yes, and an artist whose medium is textiles. Up to now, calling myself an artist, even out loud, has seemed rather...well...presumptuous. 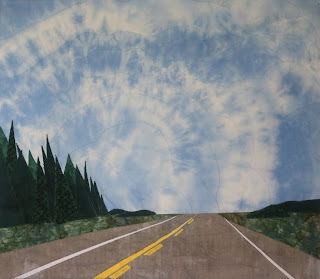 But with the acceptance of It's Still About the Sky as one of the 40 pieces (from 116 entries) selected for SAQA's "My Corner of the World: Canada"* exhibit...that title is fitting a bit better this morning. So thanks to you, Gentle Readers, for your ongoing support, comments and encouragement...and a special thanks (yes, I e-mailed her) to Elizabeth Barton, whose superb coaching skills, wisdom and depth of art knowledge have moved me farther along that road to 'artist'. I have a list of things I want to accomplish this year, and the first of these is my first piece for 15 x 15 now that I'm back from my year of study with EB. I'm spending at least this morning in my "messy room", puddling with printing samples. Stay tuned! Linking this up with Nina Marie and her "Off the Wall Friday" for a great start to more art in the New Year. Have a Happy One, eh? *MCOTW: Canada, together with the international exhibit, My Corner of the World, will open at the Stratford Perth Museum in London, Ontario, in May of this year. You've earned it, Margaret! Beautiful! Congratulations Margaret. What an honor to have your art selected from such a large number of submissions. You know how much I love this piece. Happy New Year. Congratulations Margret. My friend Al had his piece accepted to. Alas I did not have mine accepted or my other 2 fellow group members but I think it will be an excellent exhibit to see. We plan to go see it as it is about an hour from our home. It is so exciting that this exhibit starts in Canada. You have worked hard this year in your class with EB enjoy your success! That's great Margaret! Well done, YOU! Happy New Year to you too. Have a great, creative year. Congratulations on getting accepted. Your piece really is all about the sky. Beautiful! What an honor and an auspicious start to the New Year. It really reflects the wide open country roads in Canada. Happy New Year! Awesome Blossom! And YEs you ARE. Good for you, Margaret. I hope to move my 'artist' further along this year as well!!! Congratulations! And of course a happy and creative new year. Congratulations on your acceptance. It's nice that you finally see yourself as we do....an artist.